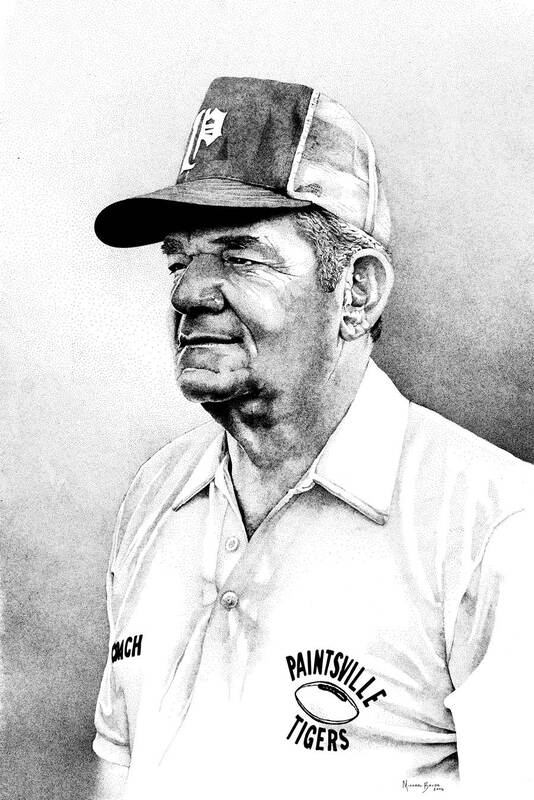 Pen and ink drawing of my dad, Walter Brugh, who coached football for 44 years at Paintsville (Ky) High School. Pen and ink illustration by Michael Brugh, 2006. A personal note, about my father, Walter James Brugh, Sr.
My father was a football coaching legend at Paintsville (Ky) High School. He played football for Paintsville, then fought in the Philippines during World War II. He returned home, graduated from Paintsville High School, then went on to play college football at The Citadel. He then returned home to coach Paintsville football from 1951 (as an assistant coach under Jim Wheeler; he became head coach in 1955) to 1994. He amassed a record of 280 wins, 136 losses, and 5 ties. He is even in the 1993-94 Congressional Record. This post does not even begin to list his accomplishments. Perhaps one day I will honor him with a proper site as a tribute to his enduring legacy. He passed up many chances to coach college football in favor of helping young boys become men. Men of honor, good character, and assets to their families, their team, their community, and their country. I am blessed and proud to be called Coach Walter Brugh’s son. His way of motivating us to play hard and play our best began in the locker room. Before each game, he would have all the players, coaches, and managers, take a knee, while he performed two tasks: Reading C. W. Longenecker’s “The Victor,” and reciting the Lord’s Prayer. We were all the better for it. My father passed away Feb. 11, 2014, at the age of 87. His spirit of excellence, his determination, his exuberance, his good character, lives on. It will live on in his family, his former players, coaches, managers, and teachers. He joins my beloved mother, Nancy, who passed away in May 2011. I presented to Dad the above pen-and-ink drawing back in 2008. It was one of the few times I had ever seen my dad tear up. He was visibly moved by the gift. I am glad he was able to see it, and receive a small (indeed, a too-small token) of my love, affection and appreciation for him. A kind remembrance of dad was written by my former teacher/librarian June B. Rice, and can be found here. Another article detailing his amazing life and career can be viewed here.